TGIF - But I'm Ready For MAD MONDAYS! TGIF FRIENDS!!! I hope you had a great week and of course are ready for the weekend! I hear the Easter Bunny arrives at The Grove tomorrow in Los Angeles. It's official - Spring has Sprung! While I know weekends are never long enough, I'm actually looking forward to MONDAY! Call me craazaaaay but I can't wait to party with the ladies of MAD MONDAYS. Not only is the party FREE but they also have FREE Mad Shots AND discounted Valet (not bad for Sunset Strip!) -- I hope you can join us. I'll be performing a handful of tunes and the amazing ALASKA IN WINTER will be doing a DJ set as well!! YAHOOO!!! See the info on the flyer below! Hey Everyone! Check me out on URB.COM! I've been selected as one of the NEXT 1000! Pass on the great news and go vote for me on URB.COM! YEAH! Thanks Sly Doggie for the DOPE production!! Take A Picture is a SMASH! Have you tried it yet!? Make your own playlist to create the soundtrack of your life...It's pretty cool to remember songs you used to listen to as as kid and plop em in your list...and of course songs you love listening to now! I'm HOOKED! The Low Down and Stuff!! 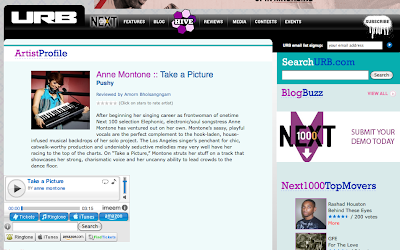 Congratulations to LA's own Anne Montone!!! On Saturday, March 7th, 2009, the singer/songwriter became the newest member of the Scion A/V family by winning the Los Angeles title in their nationwide vocalist competition. From hundreds of submissions, Scion invited the top 10 singers to their Scion Art Gallery in Culver City to perform in front of judges Franki Chan of IHeartComix, Vice Records A&R, Chris Roberts, and Dave 1 from the group Chromeo. The twist? Each competitor was given brand new music and only one week to write, rehearse, and perform 3 new songs. At the end of the 3-round, 6-hour competition the judges announced a unanimous decision that Anne's vocal styling, her fashion sense, and stage presence made for an authentic and heartfelt, winning performance. Special thanks to Producer K12 and Fashion Artist Ginger McGann. A single released on the Scion A/V record label. 6:30pm-8:30pm - Free FOOD and DRINK! 10:00pm-2:00am - Free MAD Shots 10-11! I am so so so excited to announce that I WON THE SCION CONTEST!!! I am the LA Vocalist Winner! Not only did I get an awesome M-Audio prize pack (headphones, studio mic, carrying case, Fast Track Ultra) but I also get to record a new song and have that song released on Scion's A/V label! YEEOOOW!!!! As soon as I have pics, etc -- you know I'll be posting those up. They also were taking lots of video footage of the event, so as soon as that's all edited --- you'll get the link! Thanks to everyone who has supported me over the years...I guess everything I've done up til now has gotten me to this point :-) SO Happy! oxoxxo! Win or Lose - Let's Celebrate!! Tonight!! As you know, today is the Scion Vocalist Contest...and I'm competing! Even though I don't know how it'll turn out (I have the intention of winning!) I would LOVE to invite you to join me for a "post event celebration"...over at MANDRAKE on La Cienega. I also want to thank K12, Tara Copeland and Ginger McGann for helping me prepare for today's big event!!! You da best!!!!! 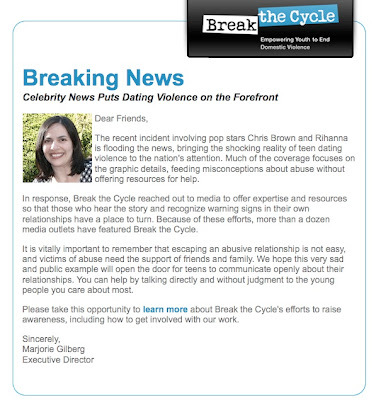 With the recent news of Rihanna & Chris Brown getting back together, I wanted to give you a link to a group that is working on empowering our youth to end domestic violence...as we know, without proper intervention and education, the cycle of violence will continue. If you or someone you know is in an abusive relationship - get help. Break The Cycle is a great resource!